Laruga returns to Mykonos after two successful retreats, this time in a new 5 star location and with a special guest teacher, her partner in mat and life, David Fredriksson! A dynamic teaching duo who will share the art of Ashtanga with both new and more advanced practitioners. Fykiada Retreats has teamed up with one of the island’s finest wellness resorts to offer an outstanding experience of yoga and Greek hospitality. 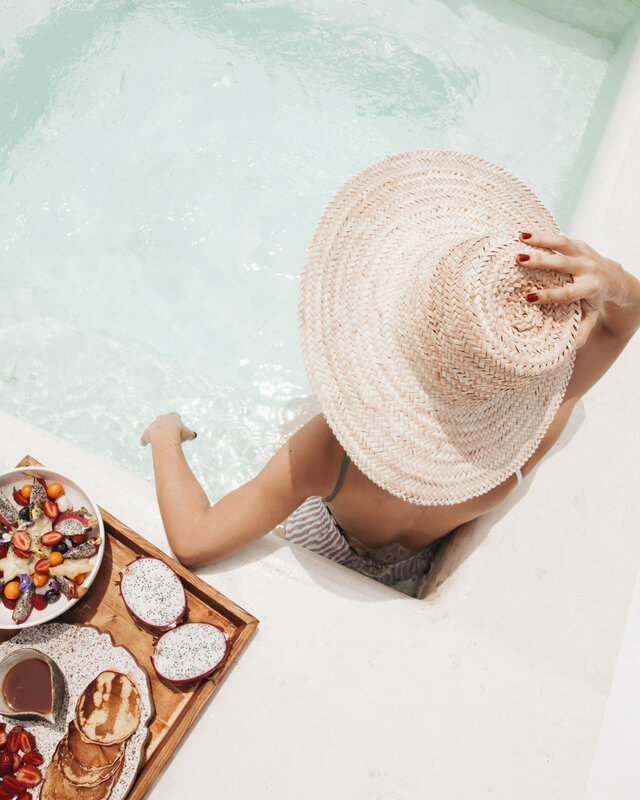 A luxury stay along with an award winning restaurant and a dedicated yogashala gazing the Aegean will provide all the zen needed for a dreamy island retreat. A rich schedule of ashtanga practices led by Laruga & David will be accompanied by outdoor adventures, fine dining nights and a taste of Mykonos vibrant culture and beach-life. Our tried & tested relationship with Laruga promises that you’re in good hands to let yourself go and immerse into the art of Ashtanga. The excellent central location of the resort offers full autonomy to its guests as it’s just a 10min walk away from a beautiful sandy beach and 15min ride from Mykonos town. You can either use the resort’s shuttle bus or get one of our eco-bikes. Click for more info and room photos. Laruga Glaser is an advanced level practitioner and student of yoga as well as a Level 2 Certified Teacher, bringing with her a combined total over 25 years experience instructing body movement. Laruga teaches as an act of deep sharing and love for what yoga develops in each individual. Read more about Laruga here. David Fredriksson took his first Ashtanga Yoga class in 2006 and from that point on, he has not stopped. In January 2011 he received his Level 1 Authorization to teach from his teacher, R. Sharath Jois. In Sweden, David teaches and assists alongside his teacher, Laruga Glaser. Read more about David here. The yoga classes will be a balanced blend of Mysore practice and Ashtanga specific workshops. Mornings will be dedicated to sitting in silence as well as chanting, to then commence the Mysore practice under Laruga’s and David’s guidance. Mysore classes will be suitable for both experienced students as well as beginners who will receive the attention and support of both teachers. The afternoon classes will be workshops going deeper into the foundations of the Ashtanga yoga practice. In between practices Laruga will lead two yoga philosophy sessions followed by group discussion. By the end of the week, you will have a greater grounding in all aspects of the Ashtanga yoga tradition and leave the retreat refreshed, recharged, and inspired, maintaining the gift of yoga. We’ve created a bespoke food experience with the resort’s team to deliver the best of Greek nature at your plate in the most creative way. The hotel’s Award Winning breakfast is a pandemonium of island goodness served in the most sophisticated set up. A special vegetarian / vegan section has been created specifically for our retreats where you can enjoy a delicious variety of non-dairy and gluten free options. On top of that, there’s an amazing à la carte menu of all types of eggs you’ve ever dreamt of. The highlight of this culinary journey is a tailor-made dinner experience. The chef is one of the most acclaimed Greek chefs and has created a special three course menu just for Fykiada Retreats. His approach to Greek cuisine is modern, yet based on traditional recipes and the best quality ingredients. Fine dining has been taken to another level! * Suggested for couples, friends or family who are willing to share a Queen bed! —> In case your flight arrives earlier, there is a luggage room and a change room to leave your stuff and spend some time by the pool or the beach. You can either fly directly to Mykonos airport (code JMK) or take the ferry from Athens to the island. Boats to Mykonos run daily and operate from the port of Piraeus (code: PIR) and the port of Rafina (code RAF).